To reach environmental excellence, organizations must unlock and channel the ideas and energies of their staff. This can only be achieved through the effective leadership and commitment of senior managers and the development of sound teamworking throughout the organization. To this end, forward-looking organizations have formulated a range of teams, including: environmental steering committees; environmental action teams; process improvement teams; and quality and environment circles. 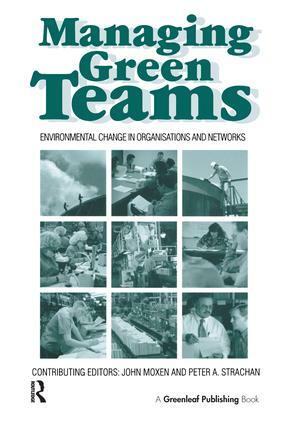 The aims of this book are to bring together practical experiences and theoretical developments in relation to the role of teamworking within the context of environmental management. Contributions from an international group of leading practitioners and academics present examples of how teamworking can be utilised to solve the complex and uncertain environmental challenges that organisations face. The book is divided into three key sections. The first section examines – in a number of different organizational contexts – the problems that confront managers during the process of forming and developing environmental teams. In the second section, the book examines how environmental teams can trigger changes in core operations and integrate environmental concerns in business decision-making at every level in the organization. In the final section, the focus of the book shifts to environmental networks and their role as inter-organizational co-ordinators. Managing Green Teams: Environmental Change in Organisations and Networks will be of particular interest to educationalists, consultants and practitioners. Teamworking is a well-established field, but, to date, no book has made any attempt to fully integrate teamworking and environmental issues.